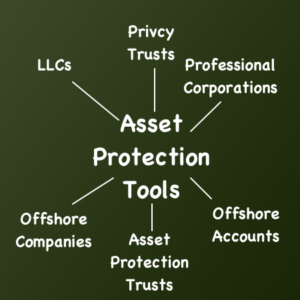 Here is how asset protection works. A proper asset protection strategy plays multiple roles in in shielding you from lawsuits and creditors. Your plan will remove a legal opponent’s leverage. It will put you in a position of strength. It will turn the tables so that you can use the legal system to your advantage. You can set up a plan for yourself, your family and your companies. When you start creating an asset protection plan, the first thing you do is identify all of your assets. This may include your home, your investments, properties, vehicles, bank accounts, business equipment. Figure out which assets can be seized by a judgment creditor. Then get the details, including the value, for each non-exempt asset. Once you have your list of assets you start to put them into secure containers. Before this, a person must realize he or she is vulnerable. Surveys show that most lawsuits come as a surprise. Most people do not expect to be sued. Some of the most common lawsuit causes of action are automobile accidents, divorce, and slip and fall. They typically do not tap you on the shoulder and tell you they are coming. So best you prepare before the big ugly process server shows up at your doorstep. When you have an asset protection plan in place, you generally control all of your assets either directly or through legal tools. Specifically, you control the entity that actually owns the assets. You are the managing partner of a legal entity, with minority ownership. You could be a 1% owner and have 100% management control and 99% of your assets are inside of the entity that you control. Just having this in place makes you a poor target for an aggressive legal opponent. Alternatively, you may have indirect control. An example of this is the control you have through the trustee of an asset protection trust. The control you have here is that the trust is drafted according to your instructions. The trustee is legally and contractually bound to follow your instructions. Once they find out that your assets are in a protection plan as described here, they no longer have a clear path to your assets. Plus, they will know that a huge payout at the end of the line isn’t realistic. This is a deterring factor for your opponent. Now the attorney who was going to get a cut of the prize sees that there isn’t a prize anymore. The playing field not level at this point. It is slanted in your direction. Many individuals who have solid asset protection plans in place never have to activate their plans. Having them it makes a big difference in your negotiation power. So, having one in place will deter legal opposition. First, you set up your asset protection  plan. The next step is to put all of your wealth into the legal structures. You place provisions in your entities so that you can move the assets within your plan. Thus, if you are in a legal battle, you can move your assets so that they are not within reach of a judge or court. A very small percentage of people will actually have to go this far with an asset protection plan activation. However, for those who didn’t have one in place, would wish they could rewind the clock. The big secret is to simply do this before a legal battle raises its ugly head. But if the time has already come, act as quickly as you can before you estate is wiped out by a legal battle.